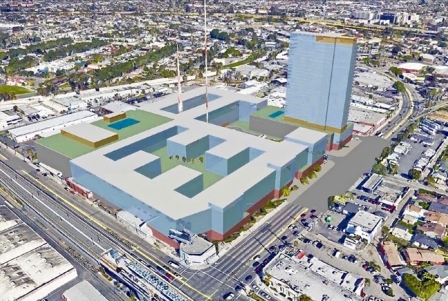 Proponents of a measure that would temporarily halt major development projects in Los Angeles said this week that they are moving forward with their initiative, after Mayor Eric Garcetti failed to offer up a substitute plan. Jill Stewart, campaign director for The Coalition to Preserve L.A., said the group submitted a petition with nearly 104,000 signatures to the City Clerk, more than the 61,487 valid signatures needed to qualify the Neighborhood Integrity Initiative for the March 2017 ballot. The coalition's measure proposes to temporarily ban, for up to two years, projects that are denser, taller or contain more floor area than is allowed in existing zoning and land use rules for the area. The initiative is officially named “Building Moratorium; Restrictions on General Plan Amendments; Requires Review of General Plan.” Cecilia Reyes, a spokeswoman for the City Clerk’s office, said proponents turned in signatures for the measure today. The City Clerk has at least two weeks, and potentially up to a month and a half to review and verify the signatures, Reyes said. The Coalition to Preserve L.A. said last week they would drop their initiative if the mayor came out this week with an alternative plan that met four terms laid out in a letter to him. Stewart said today they have been expecting since April to see an alternate plan, but “so far we have seen nothing from the mayor,” other than a small increase in the number of planners and a 10-year timeline for updating community plans. The alternate terms laid out in a letter to Garcetti last week include banning “ex parte,” or private meetings between City Council members and developers, and instituting changes that make the process of updating the city's General Plan, which guides what is allowed to be built in the city, faster and more transparent. The coalition is also demanding that “spot zoning,” in which developers request zoning changes, be reduced so that it becomes a rare occurrence, rather than standard practice. A fourth proposed term would prohibit developers and lobbyists from being able to pick the consultants who write the environmental impact reports needed to allow the projects to go through. The letter was signed by actors Leonardo DiCaprio, Kirsten Dunst, Chris Pine, Joaquin Phoenix, Chloe Sevigny and Garrett Hedlund, as well as several dozen representatives of community groups, businesses and homeowner associations.